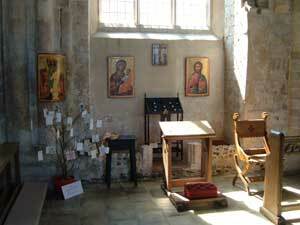 On the South Side of the Church, just beside the altar rails, there is space reserved for private Prayer. Three icons to aid prayer (see below), and one extra icon for the season on the pillar to the left (eg Christmas and Easter). There is a Prayer Tree (to the left) and a candle stand where people can light a votive candle which will continue to burn after they have left the church. Choose a card and write a prayer on it. The prayer can be for yourself, someone you love, for peace in a troubled world, for any one or anything you think is important. Hang the card on the tree. 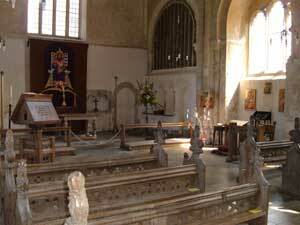 The Prayers will be read out at the Tuesday Evening Prayer Service for the next six weeks. The icons of the Mother and Child ‘Odegitria’ and Christ ‘Pantocrator’ are full size replicas of icons in the Stavronikita Monastery on Mt Athos painted by Theophanes of Crete in the 16th C. Both icons are classic examples of the highest icon art, the figures manifest an absence of sentiment, while through this stillness they emanate authority. The title ‘Odegitria’ means ‘Showing the Way’. 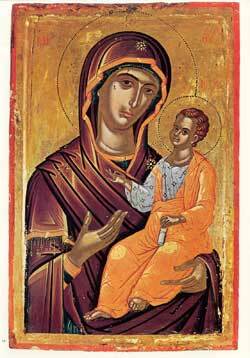 Although the Mother is the larger figure, the whole focus of the icon is upon the Child emphasised in the way the Mother inclines her head towards Him and indicates, or ‘offers’ Him with her right hand. 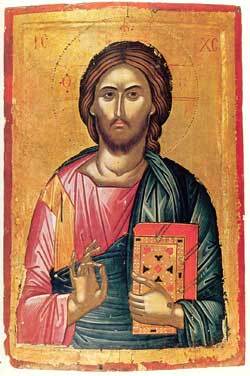 The title ‘Pantocrator’ means ‘Ruler of All’, reflecting the spiritual status of the figure. But who is he? The answer lies in the two names on the icon. The ‘internal’ name appears as the Greek letters Ο ω Ν within the triple rays of the halo. ‘O’ is the definite article ‘the’, meaning that what follows in the ‘only one’. ωΝ is the present participle of the verb ‘to be’, indicating that this is not just ‘a’ something or someone who is, but ‘the’ dynamic, ‘BEING’, that which is the very essence of all that exists. The second, ‘external’, name appears in the upper corners of the panel. The Greek letters IC and XC, refer to Jesus Christ. Thus the icon denotes the two natures in the one person. 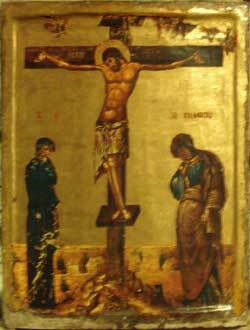 The third icon is a reduced replica of a 14th century Constantinople icon of the Crucifixion. True icons avoid the horror by which Western art tends to represent this theme. Note how the gentle curve of the crucified figure seems to emanate life, as opposed to the stiffly standing human witnesses, Mary and John, at the foot of the cross.